We've done it. We've mastered the art of time travel. It's actually quite easy! All you have to do is put a TARDIS union suit on, which is inspired by Doctor Who's trusty time machine, then take a nap for an hour. When you wake up, you'll be in the future, exactly one hour. Okay, so maybe we can only travel through time the regular way like everyone else, but taking a nap in this comfy suit makes regular time travel seem all that much more fun. We know Doctor Who has inspired the rest of your fashion choices, so why let that stop with bedtime? 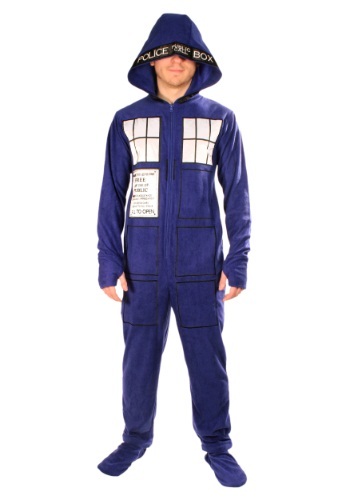 This TARDIS union suit is the best way we can think of to take your love of the good Doctor with you to bed. Maybe it will even inspire some crazy and fun Doctor Who dreams! This union suit is perfect for any Doctor Who fan. It is made of 100% polyester fleece and has a center front zipper for easy on and off. The suit is hooded so you can keep extra warm and cozy on a chilly night. The booties fasten to the legs of the suit with zippers and the soles have anti-skid material so you can wear it to the kitchen for your late-night snack run without slipping on the floor! The wrist cuffs have thumb holes so you can keep your hands nice and warm while watching a Doctor Who marathon. The graphics are both embroidered and appliqued to give it a bit of texture.